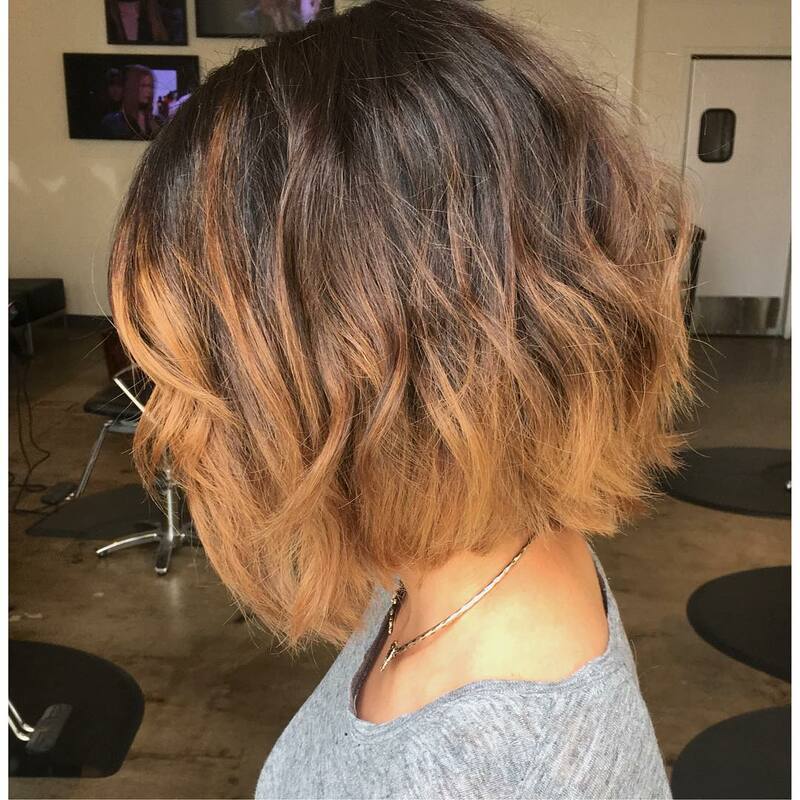 Asymmetrical bob hairstyles for round faces are the height of fashion right now, so you have a wide choice of flattering bob haircuts to choose from! And don’t miss these fabulous new highlighting colours and designs for spring and summer 2018! One of the most interesting new colour trends is the combination of purple tones with sea-green tips, which is cropping up more and more in the most stylish short haircuts for spring/summer 2018. 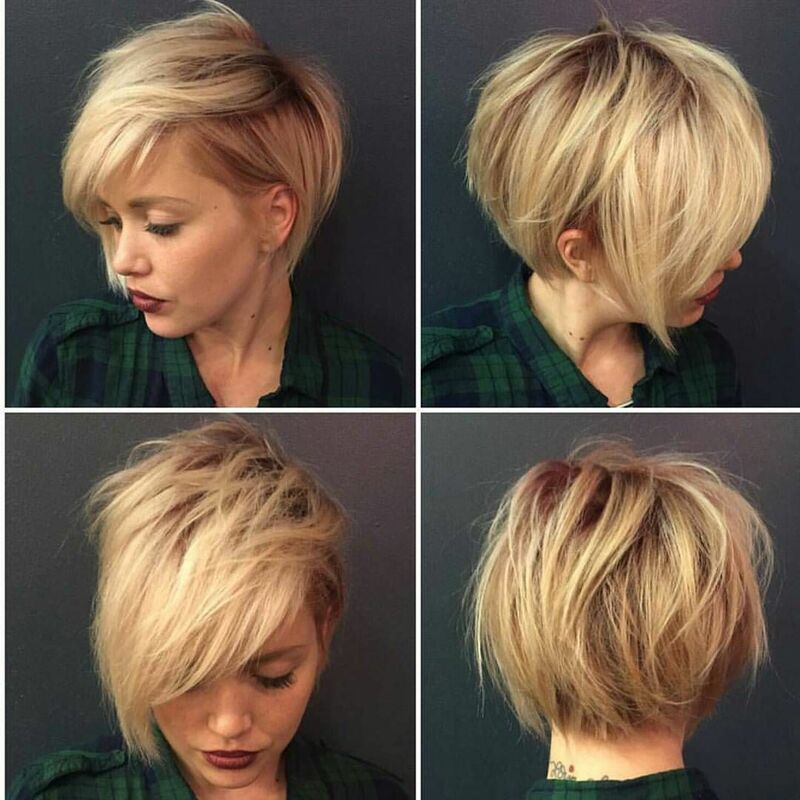 This unconventional bob hairstyle is suitable for fine or medium-texture hair. The geometric bangs ‘break-up’ the circle and diminish a wide or high forehead. It has ripple-waves and ragged ends, created by thinning the last two or three inches and then defining them with a little styling product. And if that wasn’t enough – the gorgeous lavender shade turns to subtle sea-green accentuating the unevenly textured tips! It’s totally Boho! 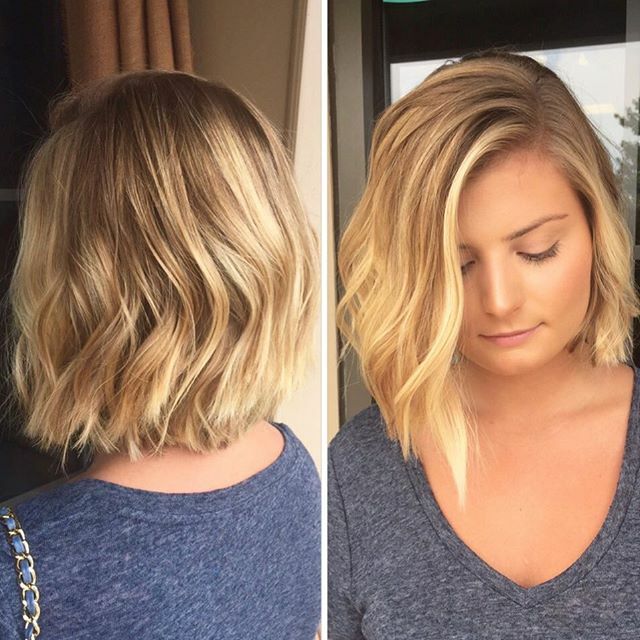 Quite a lot of flattering bob hairstyles for round faces are angled short hairstyles or have broken waves. 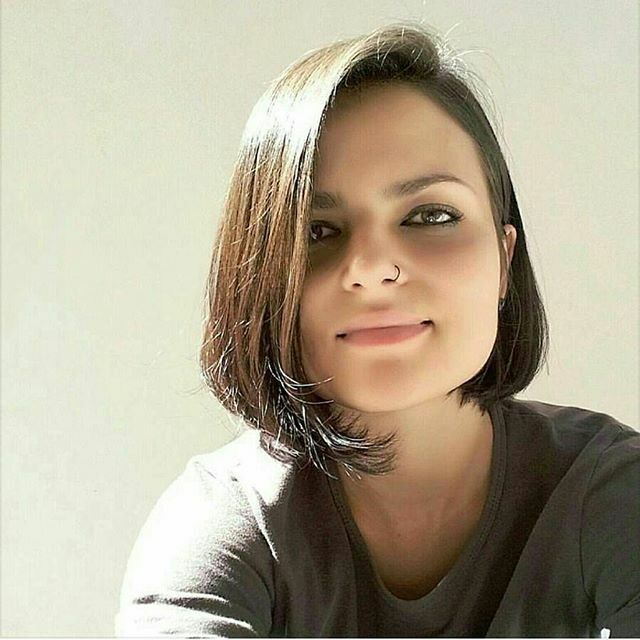 This is because a round face already has plenty of curves, so a short haircut with strong, straight lines or only a slight wave helps to diminish this. Here’s a cute medium bob hairstyle for round faces with an asymmetrical side-parting and hair draped over one side of the face to make the face appear slimmer and, therefore, more oval. 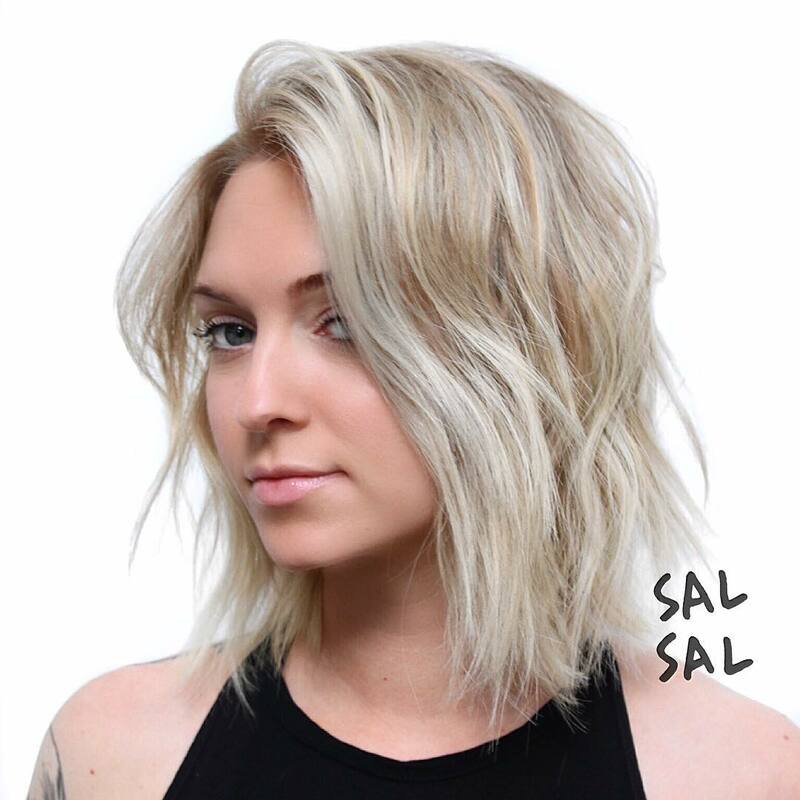 A defined section of geometric waves creates plenty of attractive texture around the lower lengths and the light-blonde highlights reflect flattering light onto the face. 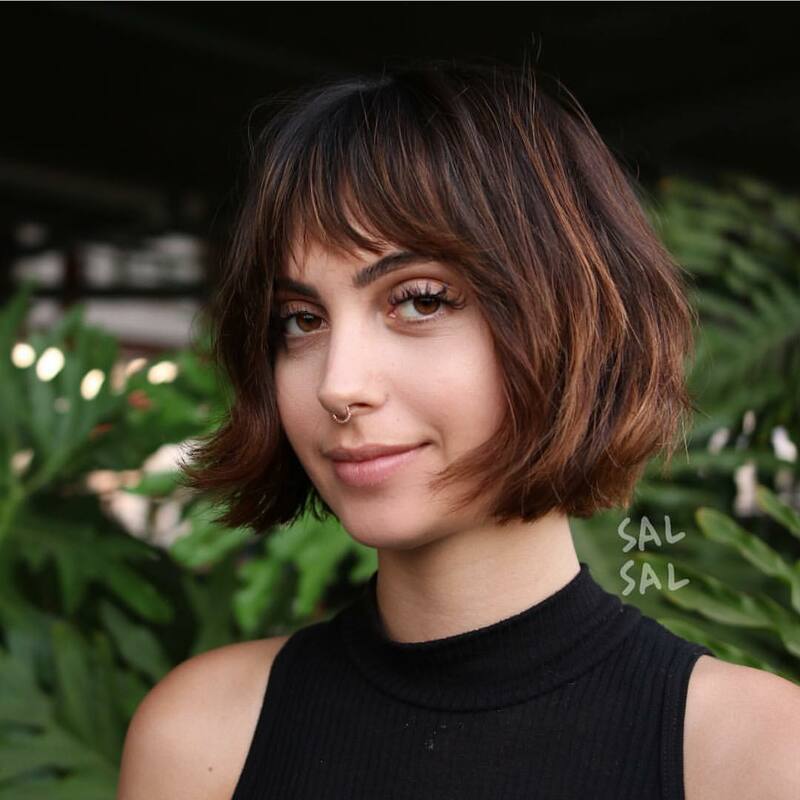 As round faces are so symmetrical, the more unevenness and asymmetry you can pack into your short haircuts, the more flattering they will be. 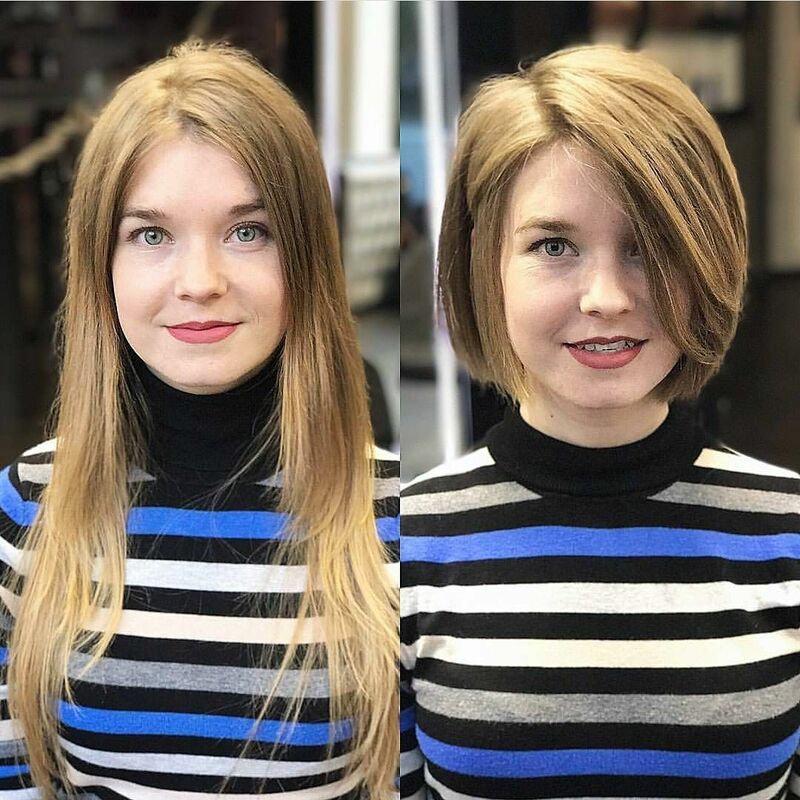 This chin-length bob hairstyle for thick hair adds length to a round face by leaving the forehead bare and minimising volume at the sides of the head. Blunt-cut ends are also a good way to add a strong, straight outline to hairstyles for round faces. And pushing one side casually back behind the ear adds even more asymmetry. 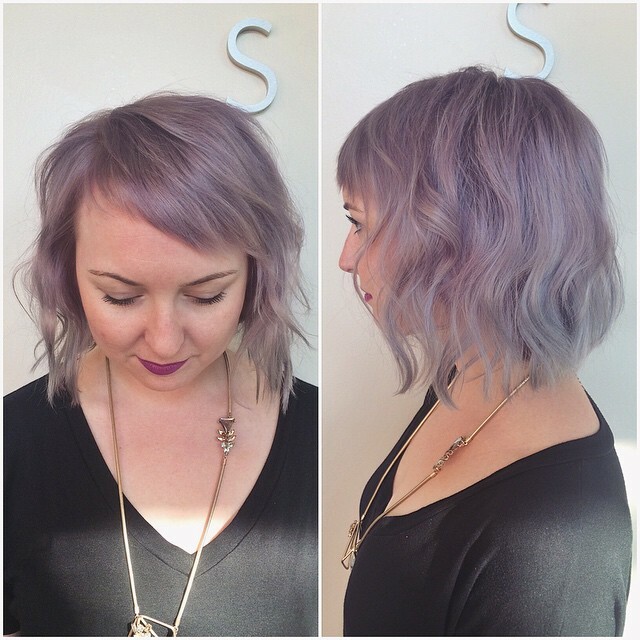 The pretty, lavender-pink highlights add extra style to a feminine and face-flattering haircut. Wear as a chic, daily hairstyle and with a cute hair accessory, for parties, too! Get more dazzle from your platinum-blonde hairdo by getting rid of those harsh dark roots and making it your all-over shade! This model’s round face has been transformed into an oval shape by placing the parting off-centre and allowing the hair to drape over the sides of the face. A strong geometric line is created by the dark, thick eyebrows. 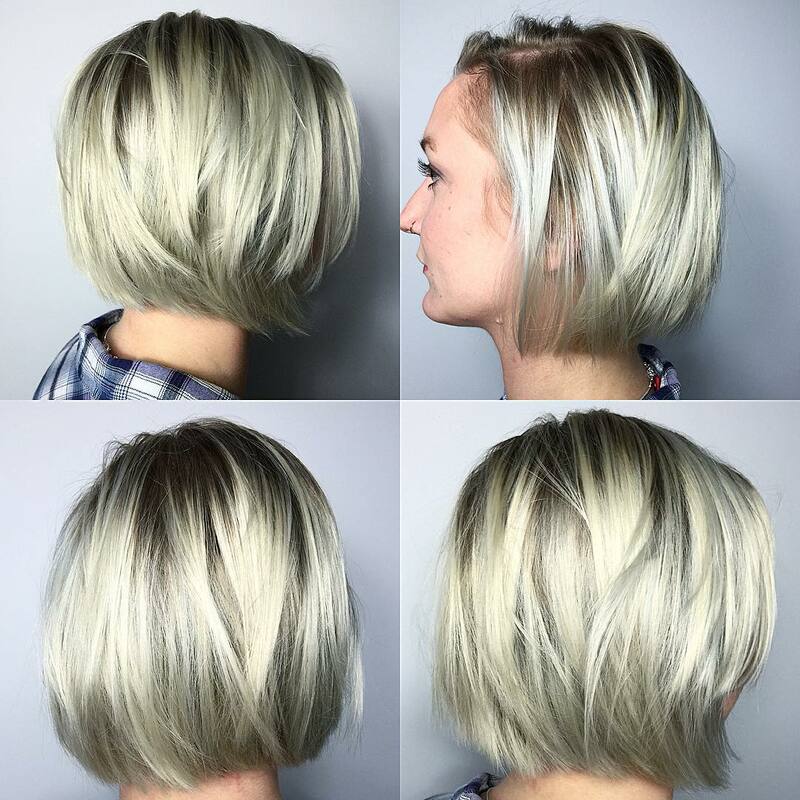 This futuristic bob has uneven, highly textured tips creating a casual, messy finish at the ends! Hair color ideas for 2018: The trend for purple and sea-green highlights in the latest hairstyles for round faces is getting more inventive every day! 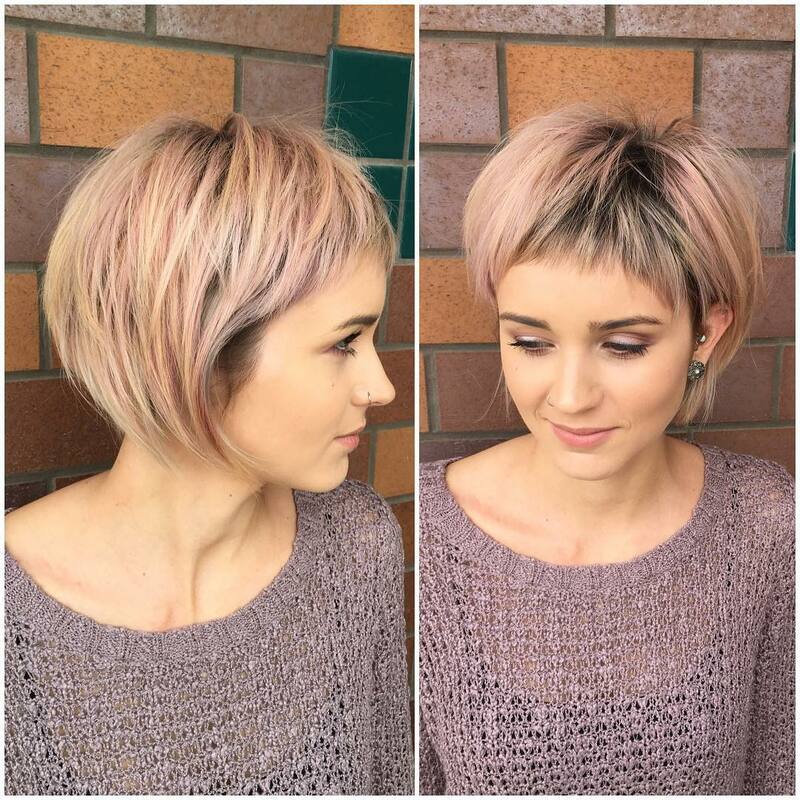 Get a load of this fantastic, multi-toned creation – lighting up angled short hairstyles for thick hair. 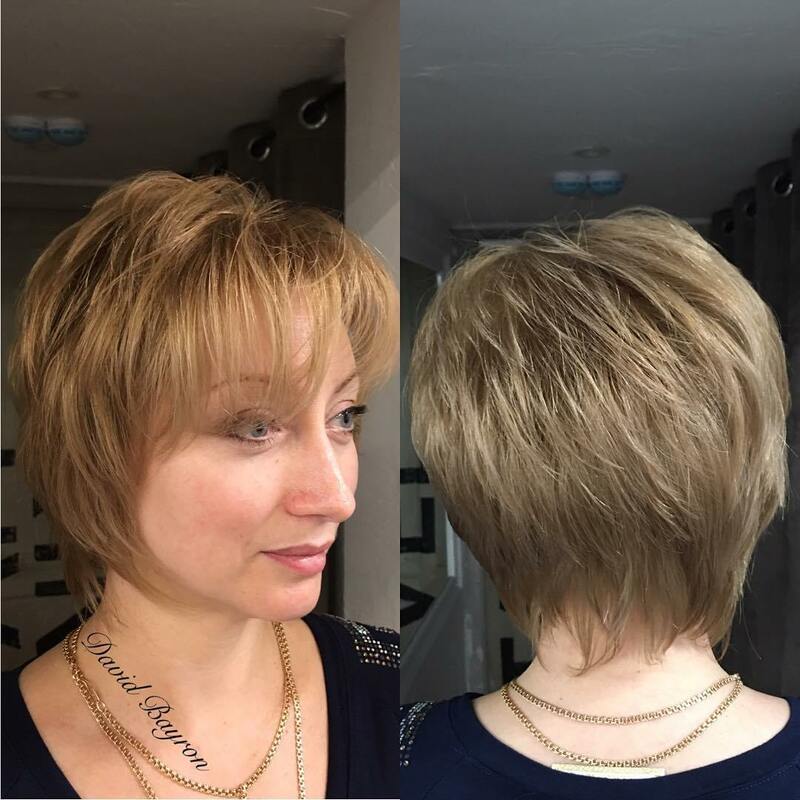 Blunt-cut tips help create strongly defined lines in the straight-across fringe on this smooth version of the latest inverted bob hairstyles. 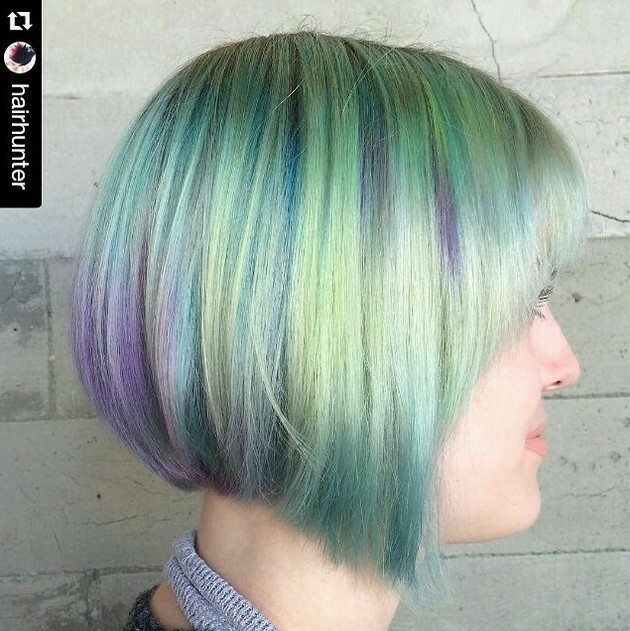 On thick hair, the expertly blended purple and sea-green shades over neutral blonde make a really amazing 3-D texture that shimmers like a hologram! This is a great new hairstyle for round faces that will make you the centre of attention at parties, on the beach and wherever you go in spring/summer 2018! 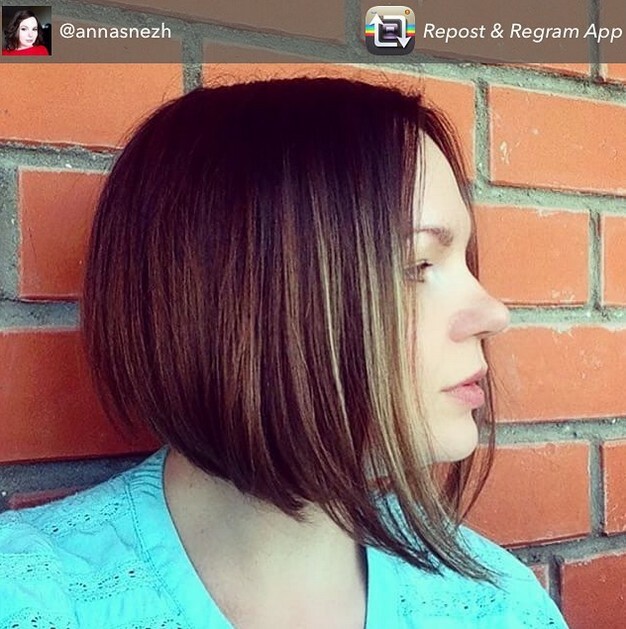 To counteract a curvy round face, keep to simple straight lines and long layers, like this inverted bob on fine hair. Cutting hair to just below the chin adds ‘length’ to a wide face, making it appear slimmer. Then, with a sweep of hair draped over one side of the face, you can ensure that only a narrower section of the face is visible. A variety of different layer-lengths is probably a better choice on fine hair, but if you do choose long layers, you can add more volume and texture by teasing/back-combing the hair into a messy finish like the image below. Looking at the model’s original hairstyle you can see that she is showing too much forehead and the widest point of her face, the cheeks, are also fully revealed. 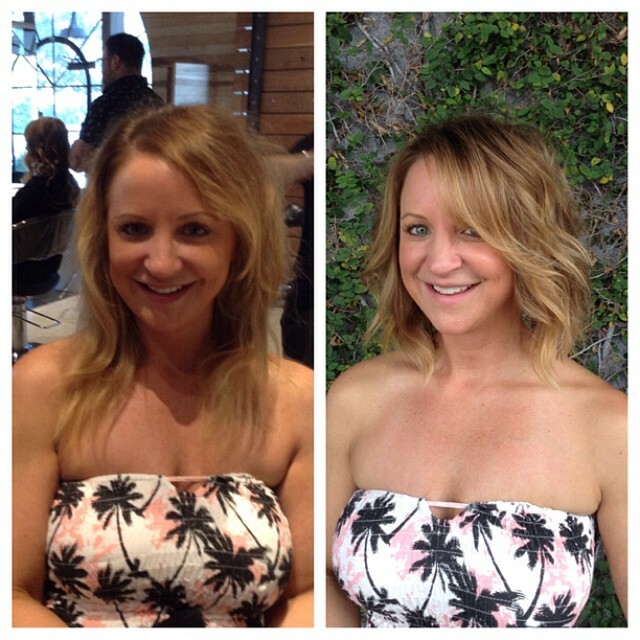 Compare that to the more flattering look achieved in the ‘after’ image, by the medium wavy bob hairstyle. The extra-long fringe sweeps down in a helpful asymmetric curve to cut the roundness of the forehead very effectively. The widest part of the face is also minimised by a curve of hair covering the cheek. In addition, the hair is given extra body from angular, broken waves, rather than round curls, which should never be worn in hairstyles for round faces. Getting rid of the long, shapeless strands on the upper chest, creates added volume to minimise a slightly pointed chin. 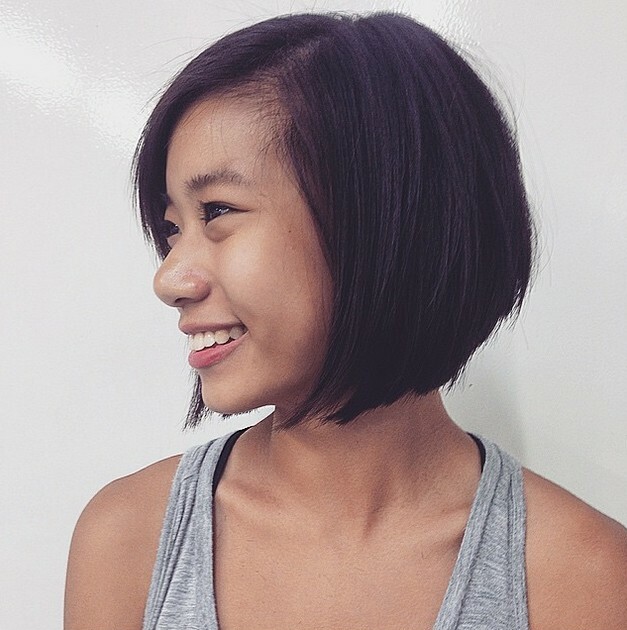 Altogether, this lovely medium bob hairstyles’ makeover suits both round and heart-shaped faces beautifully! Simple mob hairstyle for summer: Another good way to achieve flattering hairstyles for round faces is to keep the look short, simple and straight. Working with the texture of your hair is the best way to achieve the easy, popular hairstyles. 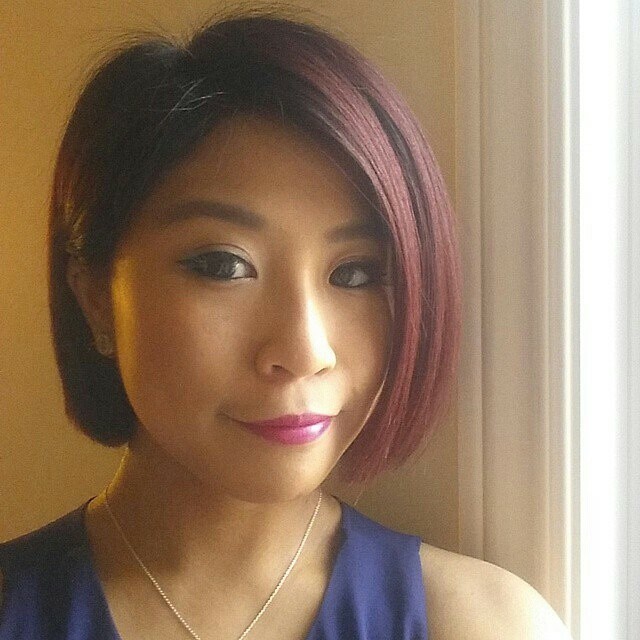 This young woman looks confident and in control with a no-nonsense bob hairstyle for thick hair. The long layers are thinned at the tips to produce uneven, choppy and spiky tips along the bottom edge. With an off-centre parting, you get the diagonal line across the forehead that favours round faces and a nice contrast between the smooth finish and rebellious spiky tips! 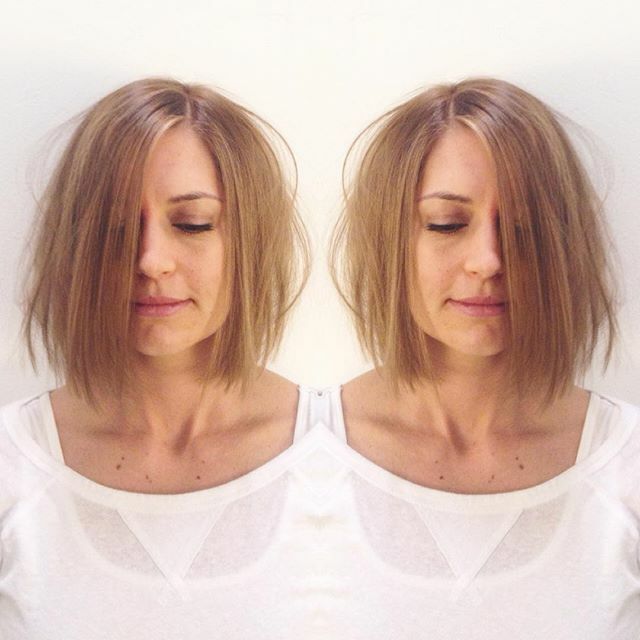 Short, straight bob haircuts are excellent for counteracting the curvy lines of a round face! 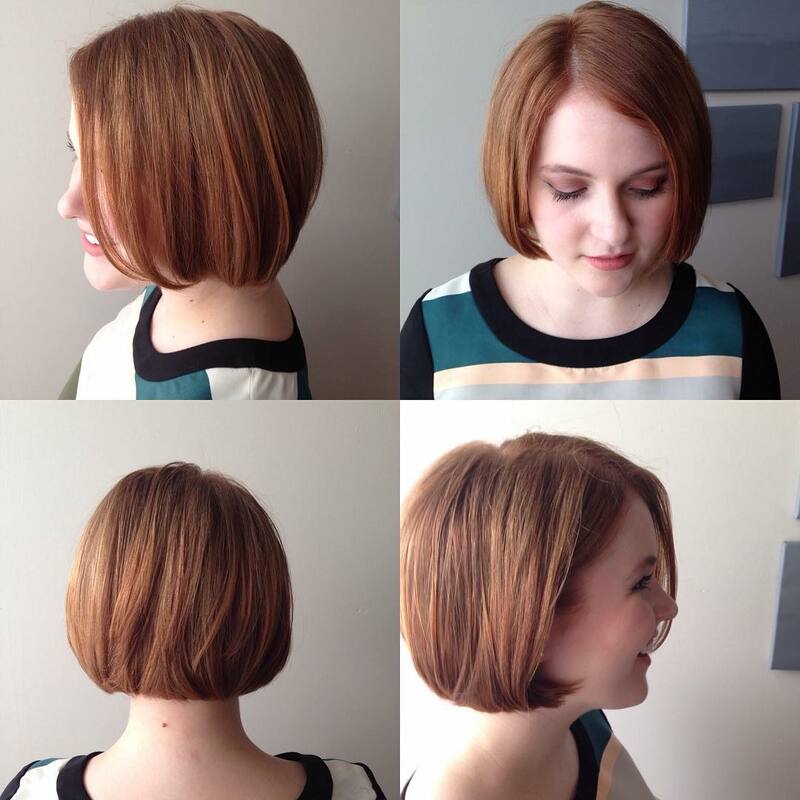 If you’re looking for chic short haircuts for spring/summer, this easy bob hairstyle is definitely one to consider! The off-centre parting creates asymmetry and the curve of the hairline cuts off the outer edges of the forehead and cheeks, bringing the face nearer to the perfect oval. The uncompromising, straight edge at chin-length reinforces the geometric vibe that always flatters a round face! Simple hairstyles are easy to keep looking good all day, so here’s another of the easy hairstyles that’s recommended for round faces in spring/summer. Medium or thick hair is cut in long layers with heavily textured tips creating a contrasting spikiness along the bottom edge. All-over blonde is beginning to take over from the urban dark roots look and produces a more feminine and contemporary finish. 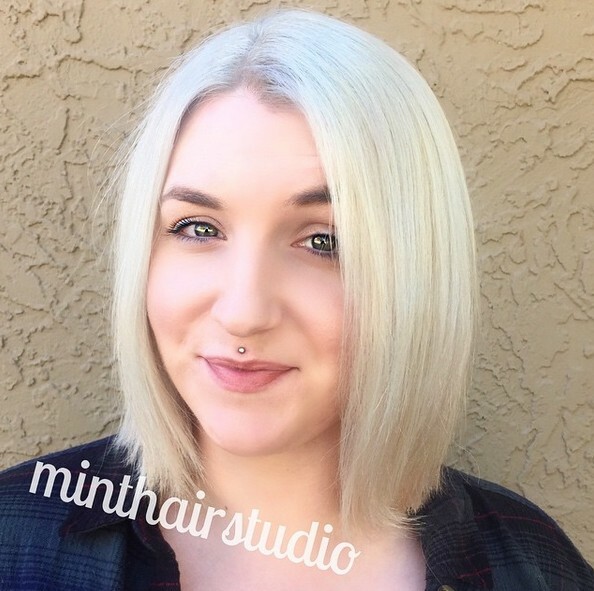 This cute bob matches the edgy piercing above the upper lip and focusses beautifully on the model’s eyes and lips! 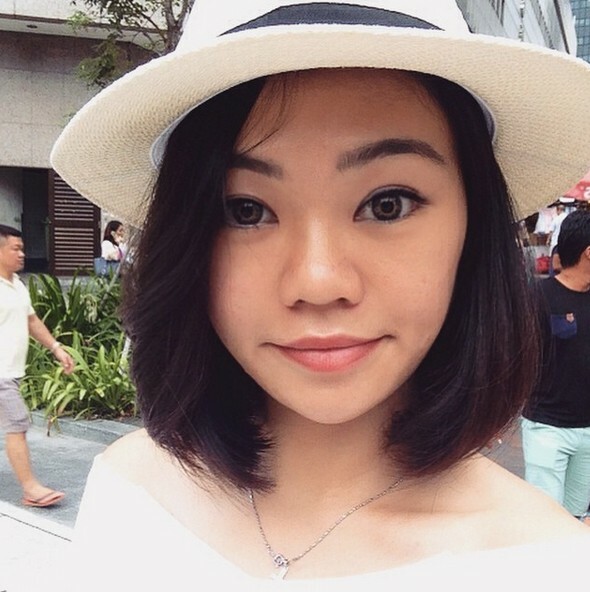 Short hairstyles for Asian girls: And here’s how to wear thick, strong brunette hair to flatter a round or heart shaped face. Starting from the chin, which can be narrow on heart faces, the long layers keep their thickness at the ends. This balances out the face, ‘filling-in’ the strong facial curve from wide cheeks to a pointed chin. The layers cover the outer edge of the right side, minimising width. However, the layers on either side of the chin are curved-under to look thicker and add extra width at this narrow point. 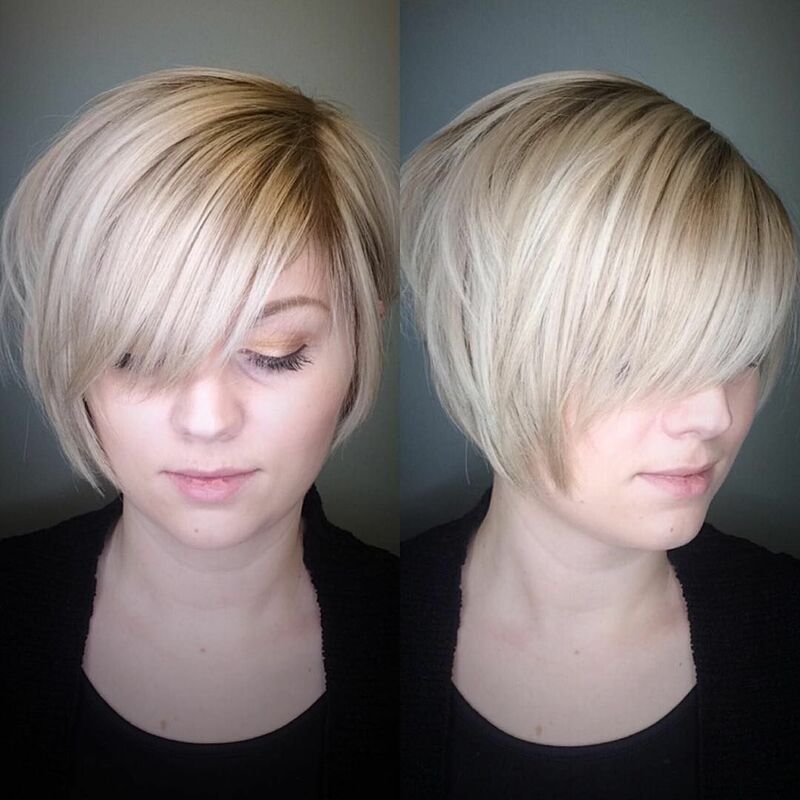 The smart, white straw-boater tops off this super choppy bob hairstyle perfectly, by adding face-lengthening height on top! This super-chic bob hairstyle for round faces is a ‘bowl-cut’ with some cute extra details at the sides. 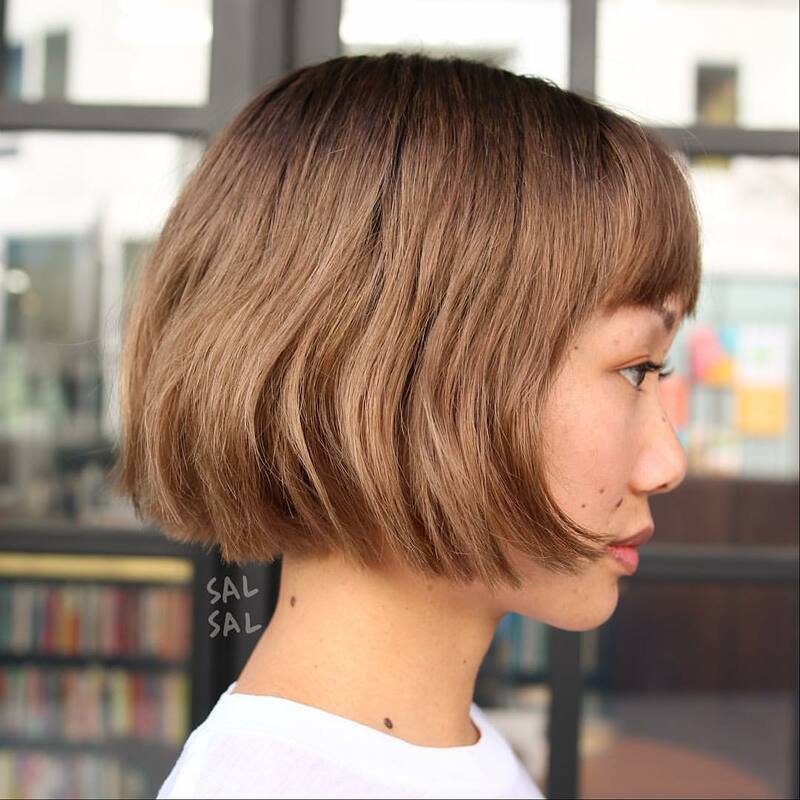 Suitable for thick hair with natural volume, this precision-cut short bob uses strong lines in the full, straight-across bangs to break-up a round face. Notice how the fringe is cut in a soft curve that’s slightly longer at the sides. This is a clever way to make a cute oval frame around the upper face. The sharply pointed details at the sides add lots of style and help slim down full cheeks and a rounded chin! 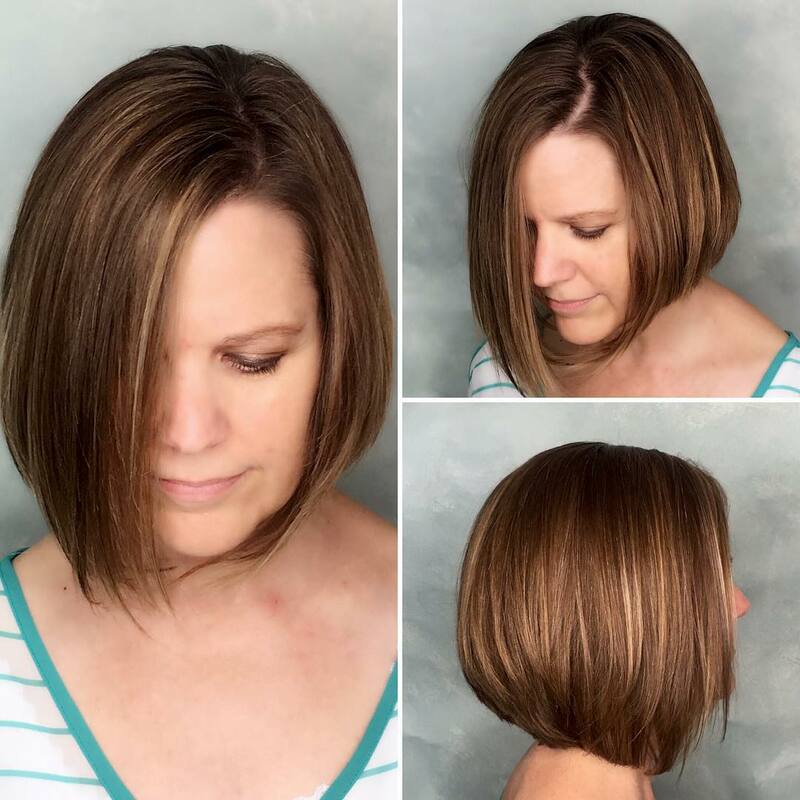 Classic bob haircut with blunt bangs: Here’s another great style for thick, straight hair that just falls into place after washing – so it’s an easy hairstyle to keep looking good every day! The sliced layers are long, with some clever converse layers at the ends to sculpt a slightly curved shape. Shorter strands around cheek level help to break up the roundness of the face. Cutting hair to just below the chin is an effective way to add ‘length’ to a round face and balance out a narrow chin on a heart face. 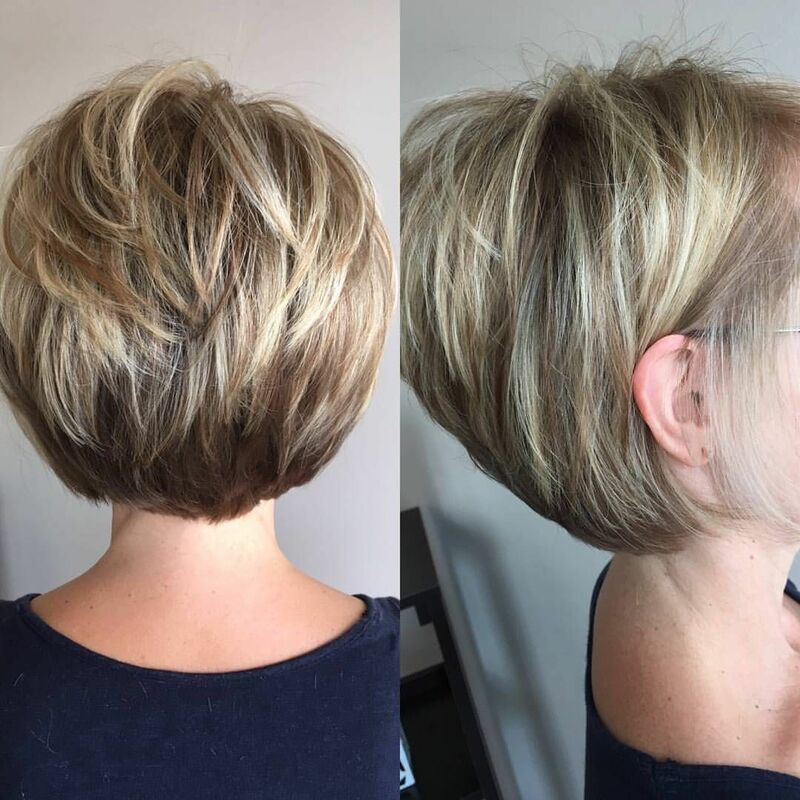 Neutral blonde is the one of the most popular, new blonde shades for spring/summer and this lovely haircut really accentuates the model’s bright, blue eyes! Thick and coarse hair types need firm control to bring out their best look. 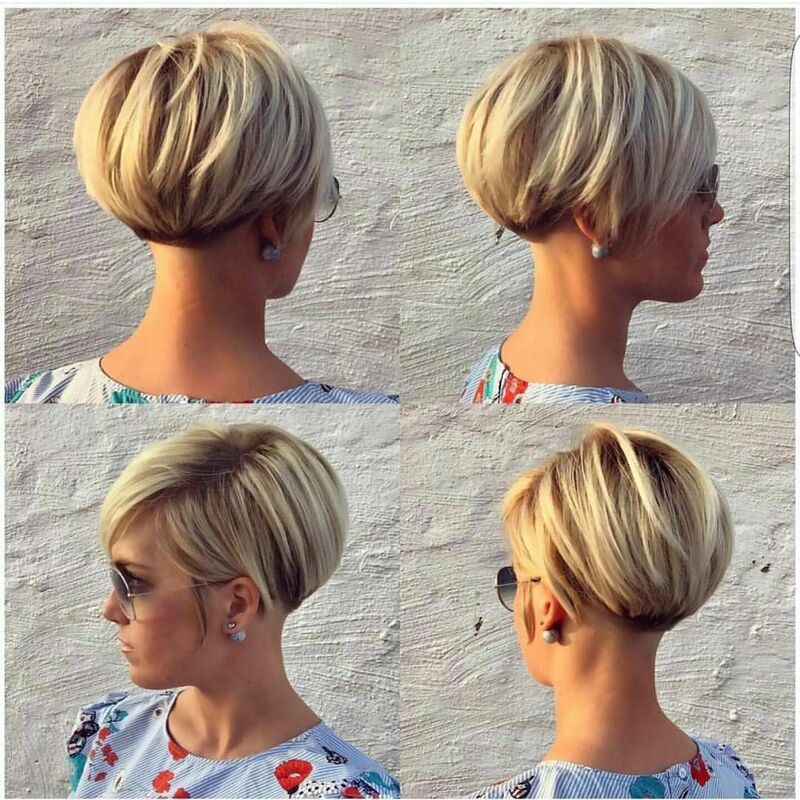 This chic version of the angled short hairstyle has a beautifully-curved back, sculpted from a stacked-back inverted bob. Add length to a low forehead with a swept-across front section that follows the hairline, without covering the forehead. The lines are strong and confident in a contemporary look that will keep you looking efficient at work and stylish for any occasion! Perfect for making a stunning style statement at a party, nightclub or other special event, this elegant version of the popular angled short hairstyles for SS 2018, is a gorgeous new look! 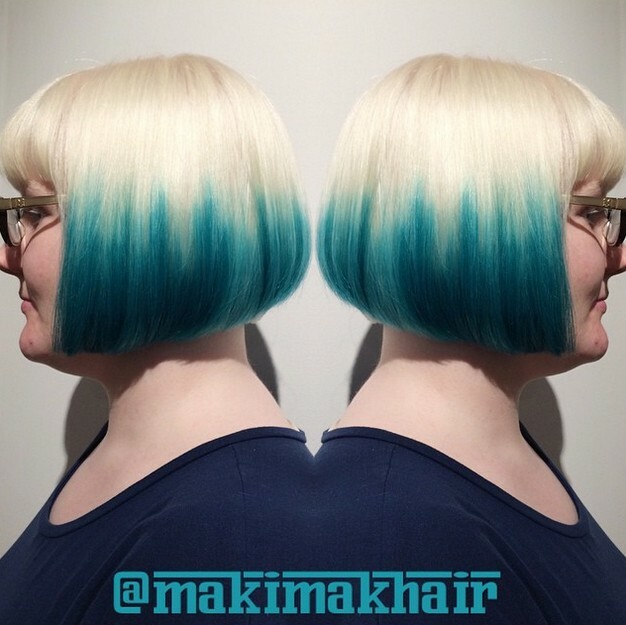 The lines of this inverted bob hairstyle are strong, yet softened by the curved blow-dry and pretty blonde and turquoise colour design. The two-tone colour is an urban-chic interpretation of the romantic long, blonde mermaid hairstyle with sea-green tips that’s a hot beach-style. Well, this is what a mermaid’s successful, older and smarter sister looks like in this year! 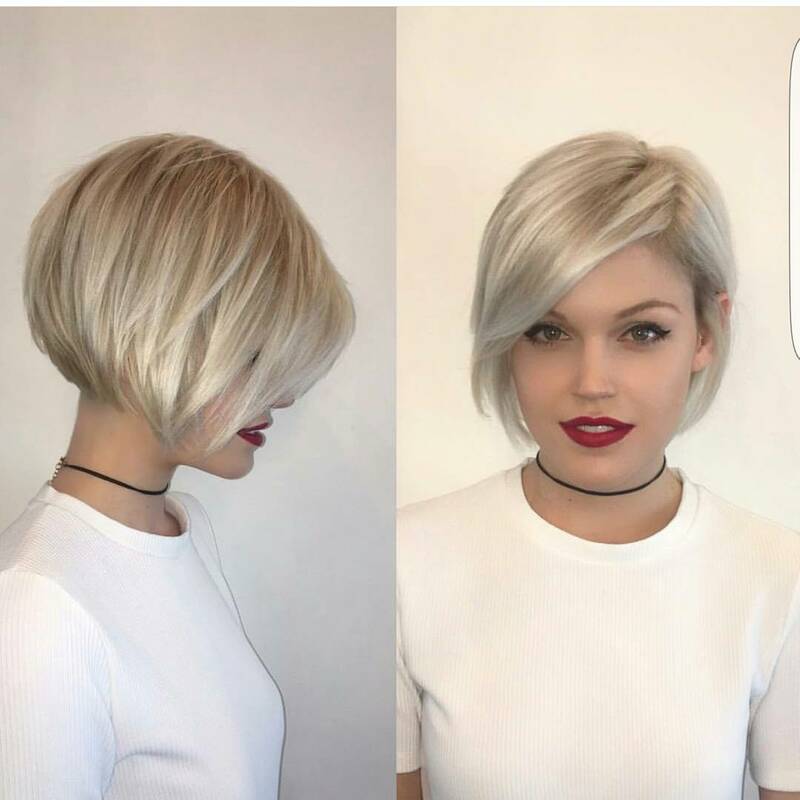 Short hairstyles for 2018: No-one ever seems to mention the ‘double-chin’ and we certainly never see it in the hairstyles photos! This makes it very hard to know which hairstyles for round faces will draw attention away from our thickening jawlines! However, I’ve found this trendy angled short hairstyles’ option that shows how to balance out a receding or thickening chin perfectly. Avoid any curls or extra volume on either side of the chin and make the front sections into an exaggerated forward-moving curve. This effectively covers a double-chin from the profile views and makes it appear slimmer when seen from the front! And those cute blonde highlights accentuate the smooth movement perfectly, too. 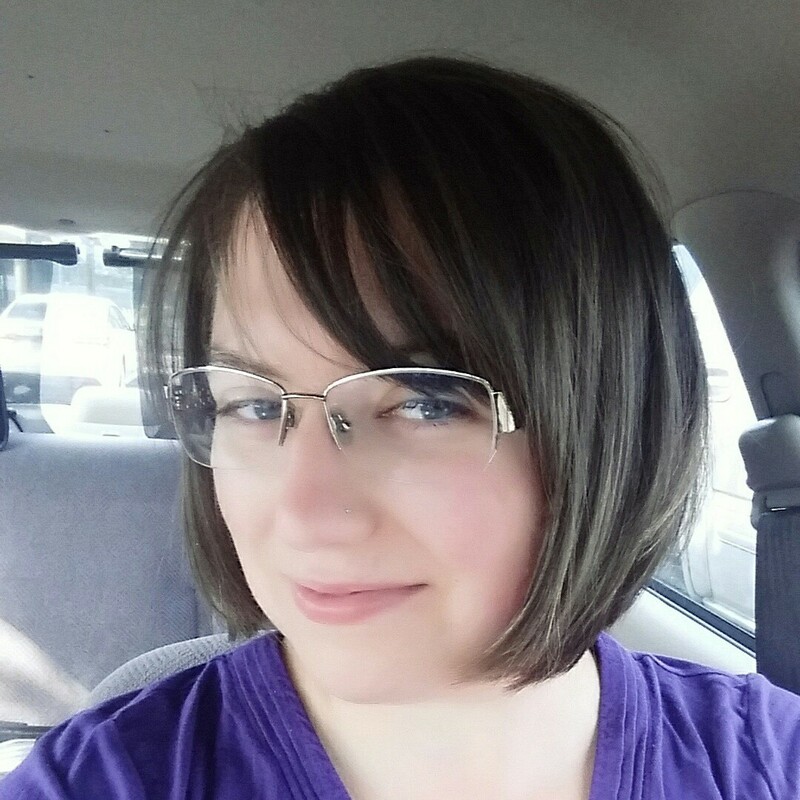 Short haircut with bangs – The rule for glasses and hairstyles for round faces is use strong geometric lines to reduce the curviness of a rounded face shape. 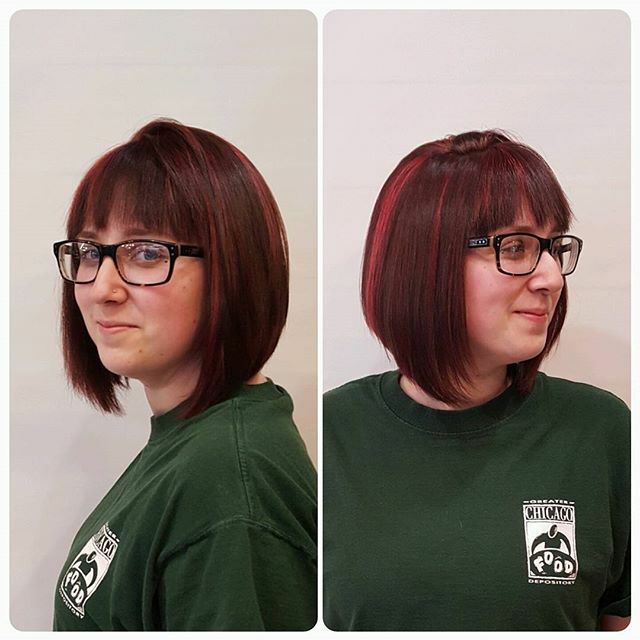 This model has chosen the perfect square frames to counteract a round face and added a flattering version of the angled short hairstyles for spring and summer, to complete her stylish look. A little extra height is always flattering to a round face and the cute, short side-parting adds asymmetry and volume. The best angled short hairstyles for round faces have textured tips around or below chin-length, to balance-out a rounded chin. 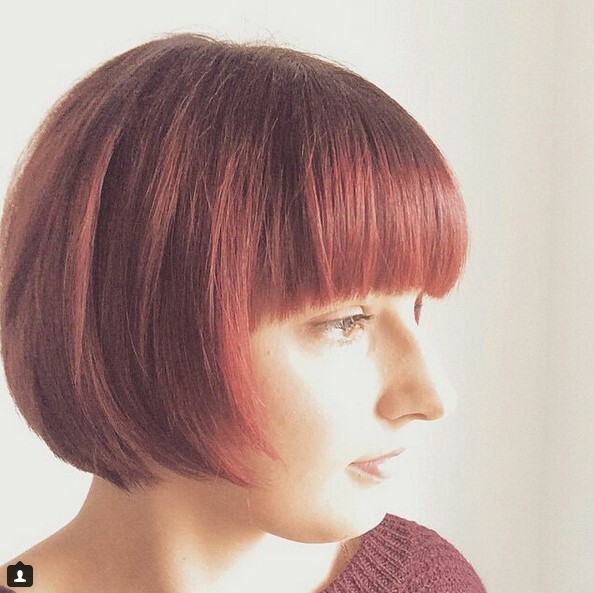 Subtle red balayage completes this easy-care and face-flattering short hairstyles option! This new, wavy bob hairstyle takes the classic bob hairstyles for thick hair and dramatically crops the length ‘mid-wave’. This produces an edgy, chopped finish at the ends. 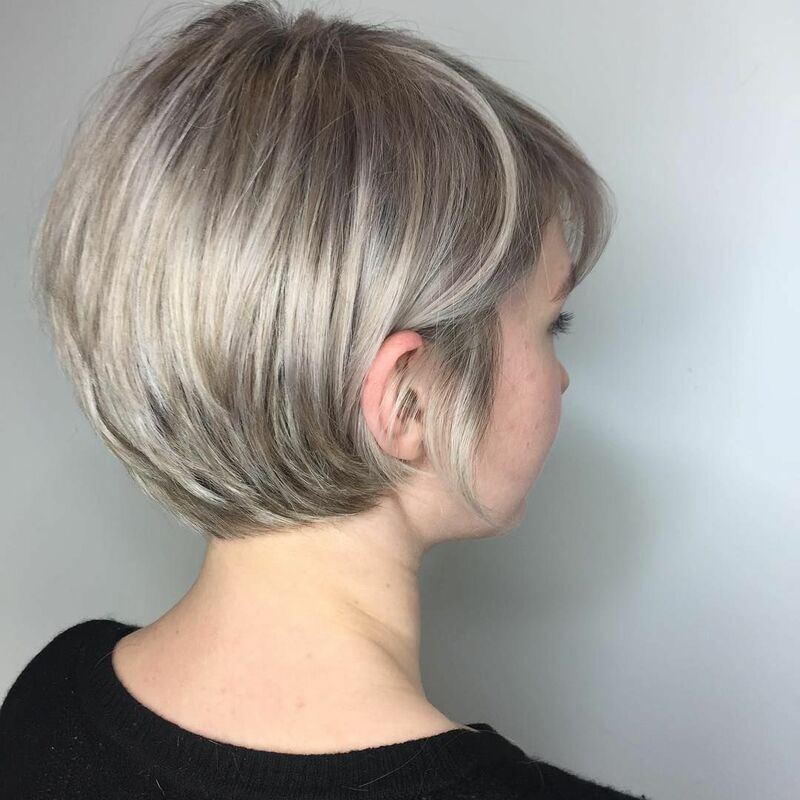 Pale blonde shades with a hint of gold suit pale complexions with warm undertones, so before you choose your shade have a proper consultation with a trained colorist. Again, a deep side-parting is used to create asymmetry and a bare forehead adds ‘length’ to balance out a wide face shape. 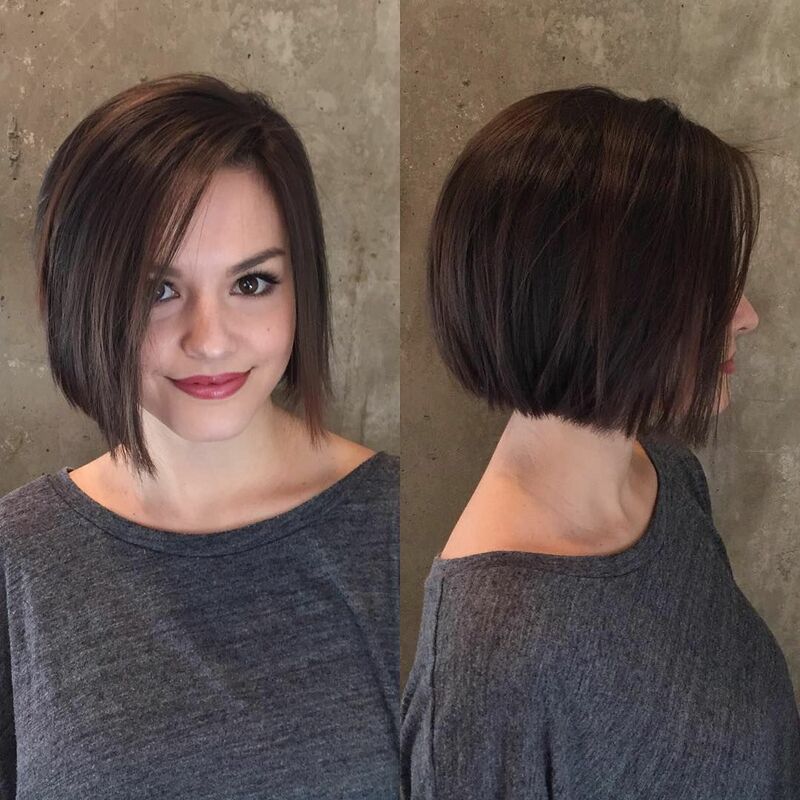 Simple easy short haircut for fine thin hair: This is one of the most popular simple angled short hairstyles for fine hair and a round face. The side parting parts the hair asymmetrically, allowing the long diagonal bangs to hide a large forehead in an attractive sweep of golden-blonde. I love to see blonde hair harmonised with brown eyes and a warm skin tone. Flattering short haircuts for round faces should be styled to minimise facial width at cheek level. This popular hairstyle for round faces demonstrates that tucking both sides behind the ears can be face-slimming and chic! 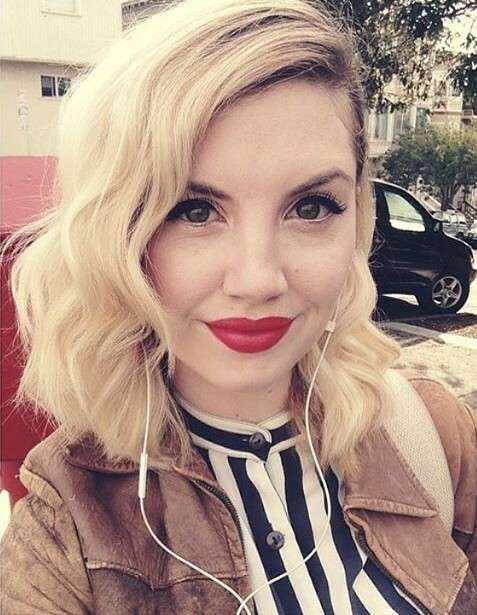 Here’s another popular and easy bob hairstyle for round faces. 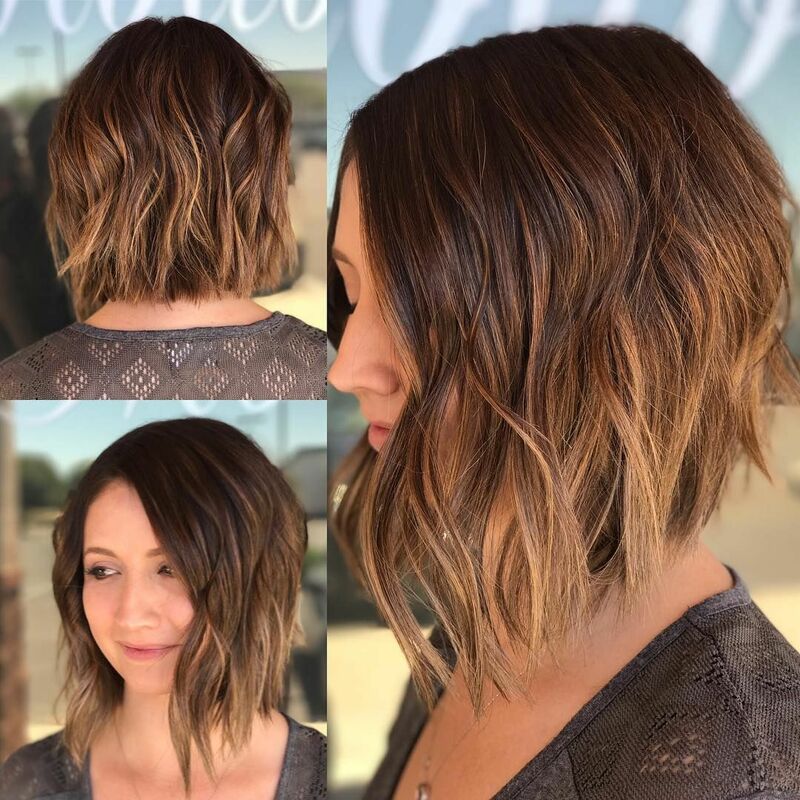 It’s a brunette bob, with long layers and textured tips, and a completely original twist – black lowlights accentuating the textured flicked-out tips! To get flattering height above a round face, the hair above the side parting has been treated with a little styling product and blown-dry into a mini-quiff. 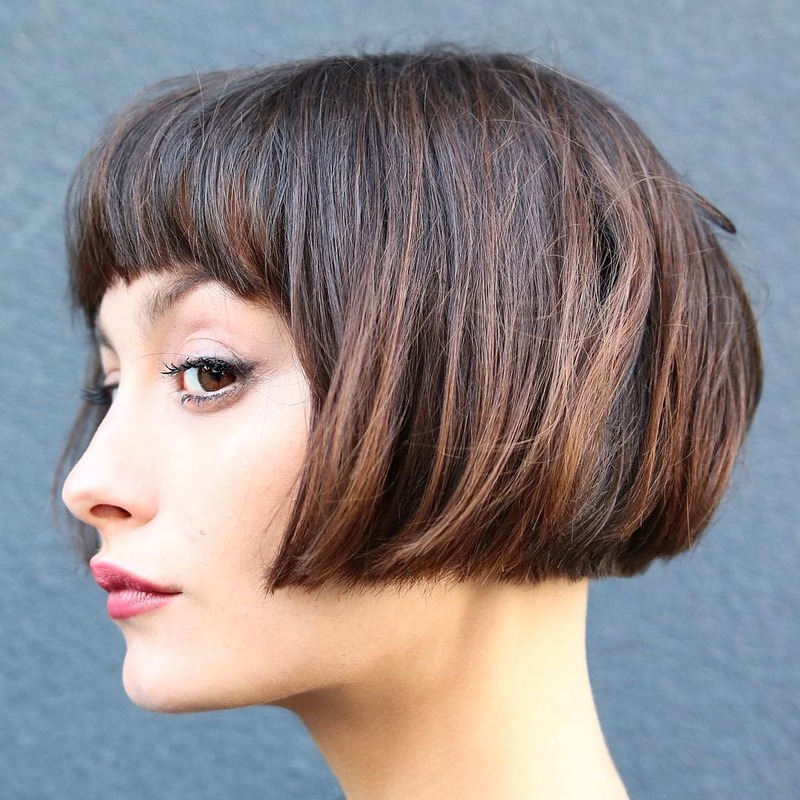 The model has quite a square jawline and this bob hairstyle demonstrates how you can minimise the ‘square symmetry’ of a strong jaw (and a round face) by draping straight hair over one side! 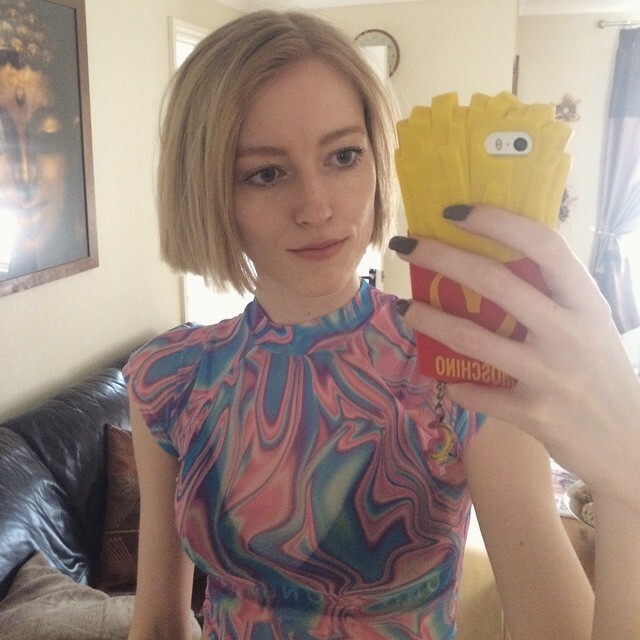 I hope you’ve enjoyed browsing my latest selection of these flattering bob hairstyles for round faces and picked up a few tips on how to accentuate the positive features of your face. It’s amazing how a few sharply textured tips can take the focus away from a round chin. 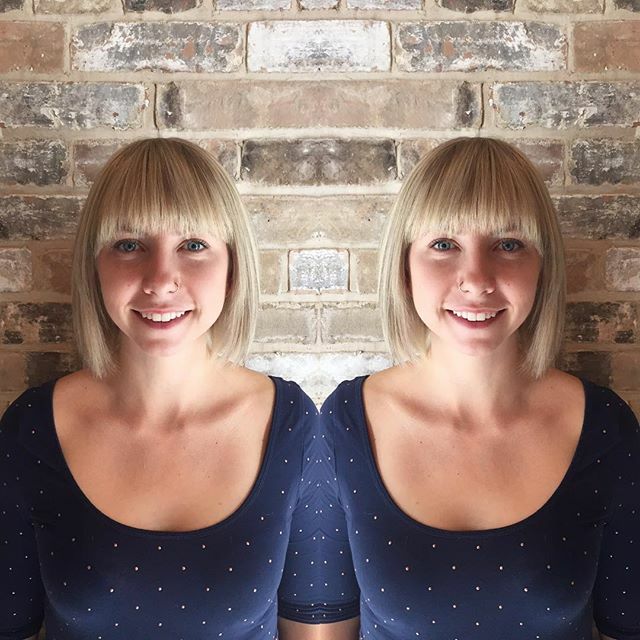 And if you haven’t tried bangs before, why not think about it now, as they are an excellent way to change your face shape – without even a hint of ‘nip and tuck’!